Let’s kick off a great school year! While the calendar may say that summer is over, we know that summer sticks around a bit longer here in Central Texas. Luckily, that means that we can find sun-loving warm weather fruits and vegetables at SFC Farmers’ Markets for a few more weeks. Dishes featuring cantaloupe, okra, pears, summer squash. . . Read more ». We're cooking up some fun! Just released: full class schedule from The Happy Kitchen. Essential knife skills, whole bird cooking, recipes with whole grains, healthy lunchbox ideas & more. 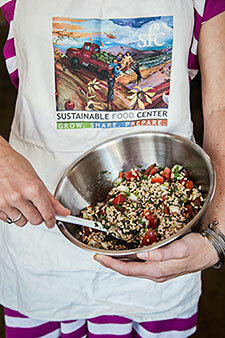 The affordable, practical & inspiring cooking classes you've been waiting for! Click here for more info and to register—space is limited! 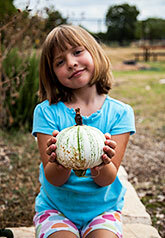 Are you interested in starting and sustaining a garden at your school? Be on the lookout for registration information about the upcoming School Garden Leadership Training! Click here or call 512-236-0074 to find out about more upcoming classes. SXSW Panel Picker! Over the years, some of the most compelling presentations at SXSW have come directly from the community. Here’s your chance to weigh in! The Happy Kitcen’s Joy Casnovsky is included in the proposed “Cooking: Education’s Most Critical Subject.” Have a look here and vote for this much-needed discussion! THE THINKERY is an evolution of the Austin Children’s Museum. It’s Austin’s sparkling new home for “why” and “how.” A place where science and families play side by side. Where people connect with ideas by doing, making and experiencing. It’s a foundry for a new generation of innovators and creative problem solvers. And it’s a heck of a good time. And until they move into their new permanent home, it’s at all the SFC Farmers’ Markets! We’ve moved! 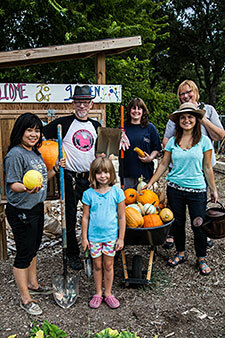 This summer, we moved into our permanent home in The Social Profit Village on Austin’s East Side, with a state of the art cooking kitchen, plenty of space to expand our programs, and a 2.5 acre community and teaching garden. Save the date for our grand opening celebration and open house on September 24th from 9:30 am-7:00 pm. Stay tuned for more details coming soon. Farm & Ranch Freedom Alliance is holding its 7th Annual Farm & Food Leadership Conference on Sept. 22-23, 2013 in Bastrop, TX. This year’s conference includes a special Sunday banquet with local food by Jesse Griffiths of Dai Due. Click here for more info. Celebration of Children in Nature! SFC is a proud recipient of the F. Lee Walker Award for Collaboration. Come celebrate with us at the awards ceremony September 17th. Click here for more info. CYC & Kendra Scott invite you to Kendra Gives Back: Where Fashion Meets Fitness on Sept. 5 from 7:45pm-9:30pm. This private 45-min ride followed by sips & snacks benefits SFC! Book your bike online here. On Sept. 7th, you are invited to a community summit on affordability in Austin, examining the daily costs that impact our lives: housing, transportation, taxes, food, healthcare, and utilities. The Summit focuses on how decisions of our local governments impact the affordability of Austin. For more info click here. Mecca Gym and Spa is raising funds to support SFC's mission each month of 2013! In September 10% of all wine and beer and in October 5% of all body products sold benefit SFC! SXSW Eco has quickly become a significant connector for professionals working to solve the challenges facing civil society, the economy and the natural world. This event serves as the platform to evolve these critical matters towards actionable solutions. Oct. 7-9th at the Austin Convention Center. Click here for more info. 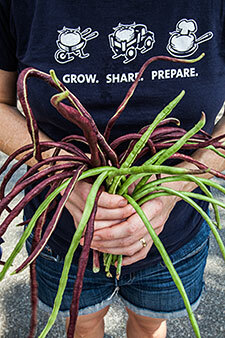 The Texas Department of Agriculture Young Farmer Grant provides grants to young agricultural producers who are starting or expanding agricultural businesses in Texas. Applications accepted through Sept. 6th—click here for more info.